This was my coffee. I like my coffee a certain way and I can’t drink it unless I have it fixed just the way I like it. Ask my husband, I won’t even let him make it for me. I drink one cup, just one, so I want it to be just right. Well this morning I left it on the counter to, you know, cool off enough to be drinkable. I reached for it and as I was taking a sip I noticed something. Yea, you know what I’m talking about. 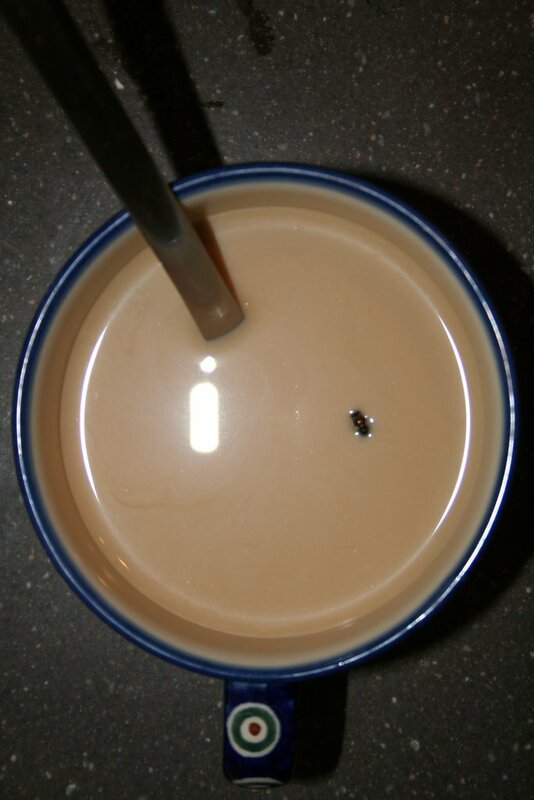 A nasty fly poisoned my entire cup of delectible coffee. Thanks fly. Anyway, the rest of my day didn’t improve much. Isabelle is on a crazy streak and it takes me longer to clean up after her than it does to just stay on top of her at all times. We had to stay home all day waiting for the cable guy to come and install our phones. We’ve had internet and TV service for weeks now, but no phone. I guess only certain technicians are qualified to install the phones. I didn’t want to miss him since I’ve been without a regular phone for what feels like forever. The good news is that tomorrow, someone else is going to clean my house for me. I have given in and agreed to have a cleaning lady come a few times a month. I think it will help my sanity tremendously. I can’t wait to see my floors sparkle and my toilets shine! I’ve had to resort to a cleaning person coming every other week too. My DH says if it helps me stay sane, it is well worth it. With you having SIX kids in the house, I would think you would need one every day! So I’m glad you are having someone clean for you, you deserve it. Gives you more time to spend with the kids! You crack me up!!! Reading your blog is the hightlight of my day!! I enjoy every EVERY entry! Hang in there Sweetie!! Can’t wait to see you guys in July! !